After its extensive restoration in the 90s, the Yenidze has been in use as an office facility. 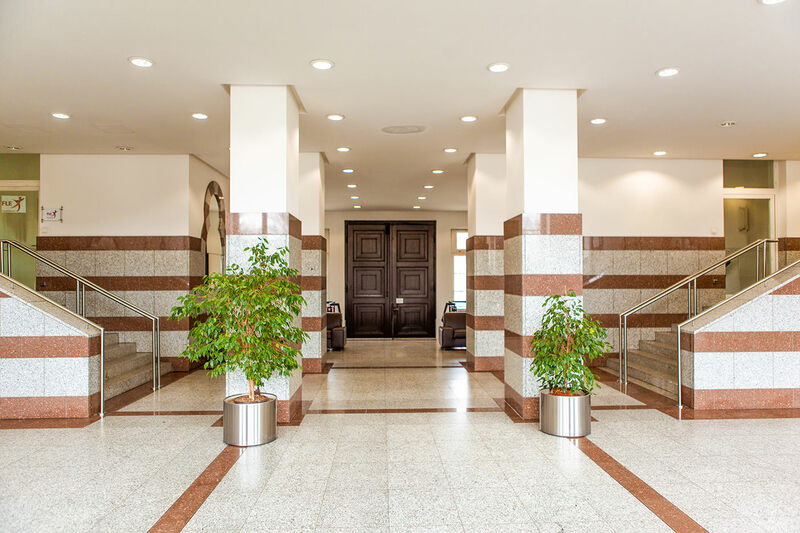 Stretching over five floors, it offers 9000 m² of prestigious, modern office space equipped with tea kitchens, toilets, as well as storage and archiving space. Currently, approximately 30 companies and organisations have moved into the Yenidze, using it as their prestigious headquarters. On the ground floor, there is a central lobby, which is staffed daily between 8 am and 5 pm. For tenants, there are 105 parking spaces available. Additionally, the Yenidze possesses two elevators taking you to the offices and one elevator which takes you to the dome restaurant. All offices are equipped with modern cabling systems and, in some cases, with window shades. Friedrichstadt is a district which is centrally-positioned at the border of Dresden’s city centre and possesses excellent infrastructure. Consequently, the Yenidze is ideally located: commuter train stations, bus stops and tram stations are all within walking distance. Furthermore, the river Elbe is only 500 m away and if you want to take a walk to the city centre, you will get there within 10 minutes. Lobby Area The Yenidze offers a prestigious office location. Sample Office Example for an office at the Yenidze. Learn more about vacant office spaces at the Yenidze now. After the wall came down, Dresden evolved to become Saxony’s strongest economic centre and belongs to Germany’s leading business locations. Its fields of competence are in information and biotechnology, electro-technology, microelectronics and in the automotive industry. Currently, every second chip manufactured in Germany is produced in Dresden. With more than 25 000 employees at more than 760 companies, the city enjoys great popularity as the biggest and most innovative location for microelectronics world-wide. Furthermore, Dresden is an important hub for international commercial routes and possesses a powerful infrastructure for logistics. Moreover, further important areas of growth in Dresden include tourism as well as the events and exhibitions trade. One the most modern congress centres, the International Congress Center Dresden, is only a six-minute walk away from the Yenidze.